(Devin P. Grimes / MTSU Sidelines). The Vanderbilt Commodores (1-0) took down the Middle Tennessee Blue Raiders (0-1) by a score of 28-6 in front of a crowd of 26,717 people under the lights at Floyd Stadium. 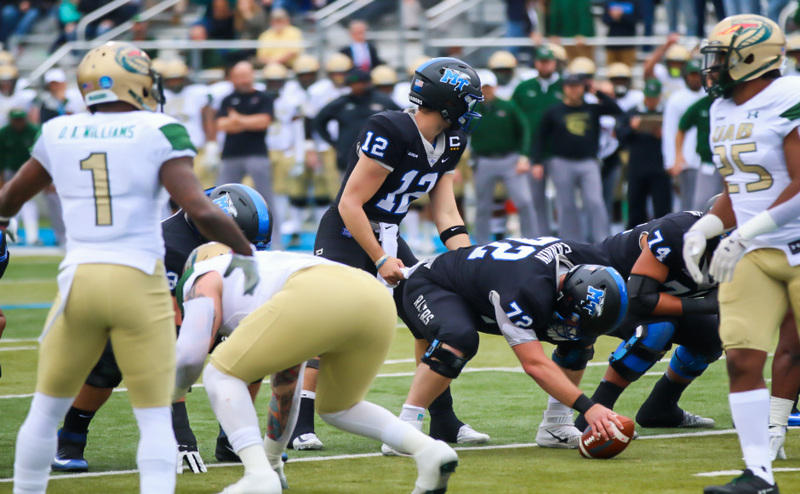 The game was also carried on national television by CBS Sports Network. The Commodore offense came out firing on all cylinders in the first quarter, taking an early 14-0 lead within the first seven minutes of the first quarter. On the fifth play of their first drive, Vanderbilt quarterback Kyle Shurmur connected on a 37-yard touchdown strike to Kalija Lipscomb to give Vanderbilt a 7-0 advantage. 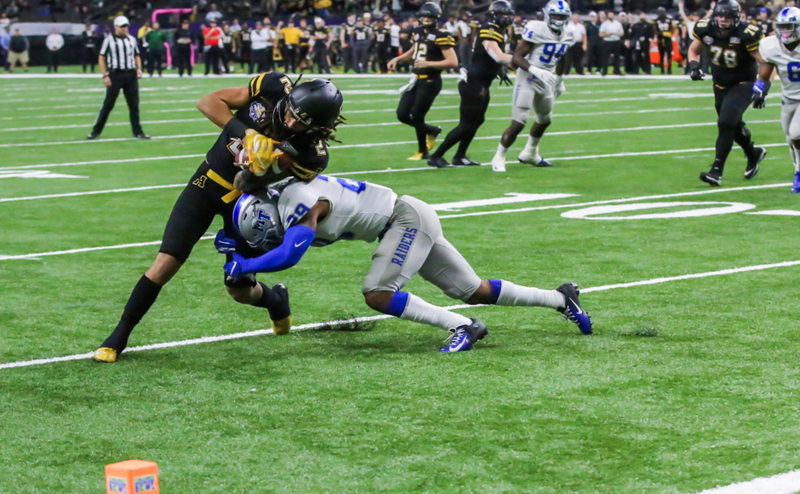 After Vanderbilt cornerback Bryce Lewis picked off a Brent Stockstill-pass on Middle Tennessee’s first drive, Vanderbilt running back Ralph Webb punched it in on a one-yard touchdown run to give the Commodores the 14-0 advantage. Kyle Shurmur connected again with Lipscomb early in the second quarter, this time for a four-yard reception on third down to give Vanderbilt a 21-0 lead. That capped off a long 13-play, 76-yard drive that ate 7:43 off the clock. The Vanderbilt defense gave Middle Tennessee fits all throughout the first half. Aside from the Lewis interception, the Commodores forced a fumble and took advantage of MTSU’s poor offensive line play by coming up with two sacks and five tackles for loss, while also holding the Raiders to just 37 yards on the ground. The Middle Tennessee defense finally came up with a stop on Vanderbilt’s fourth drive, forcing Commodore kicker Tommy Openshaw to miss a 31-yard field goal to give the Raiders the ball back with 2:41 left in the second quarter and all three timeouts to work with. The Raiders, however, were unable to capitalize offensively, going into the half with a 21-0 deficit. Vanderbilt started the second half just as they started the first, when Kyle Shumur completed a long touchdown pass of 73 yards to Webb to open their lead up to 28-0. 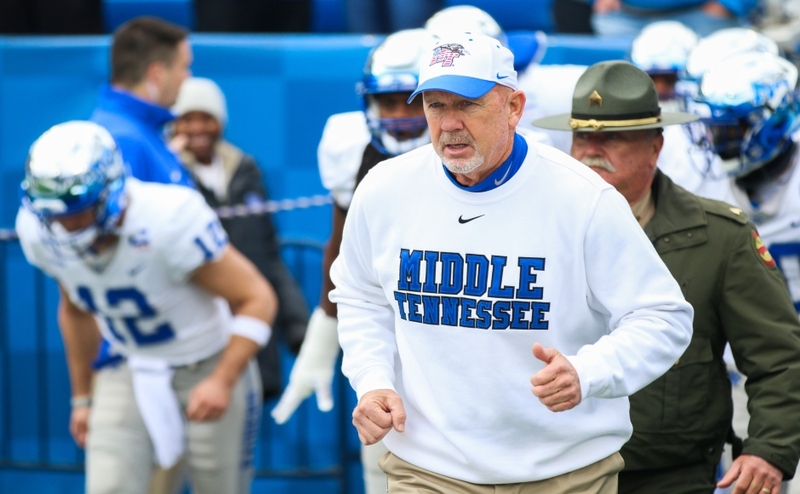 The Middle Tennessee defense did tighten up in the second half however, allowing just 122 yards and seven points compared to the 245 yards and 21 points surrendered in the first half. 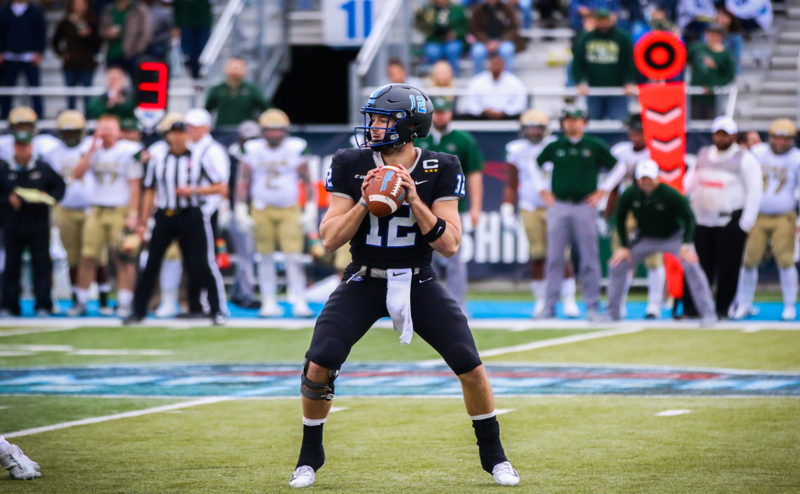 This helped the Raiders get their first score of the game early in the fourth quarter, when Stockstill found Richie James for a 22-yard touchdown pass to cut into the Vanderbilt lead and make it 28-6 after Vanderbilt’s Nifae Lielao blocked Cannon Rooker’s extra point attempt. James, the Raiders top offensive performer, finished the game with ten receptions for 112 yards and a touchdown. He also became the schools all-time leader in recieving yards tonight, as he is currently sitting at 3,083 career recieving yards. Vanderbilt’s defensive effort in the second half matched MT’s and secured the Commodore the victory. Vanderbilt quarterback Kyle Shurmur had an effective night leading the Vanderbilt passing game. The junior signal caller finished the night 20-28 for 296 yards and three touchdowns. In the first half, Shurmur completed 13 of his 18 passing attempts for 196 yards and two touchdowns. Along with completing 71 percent of his passes, the Philadelphia native got Webb going in the passing game to make up for his ineffectiveness in the running game. Webb finished the game with three catches for 104 yards and a score through the air. MTSU’s offensive line struggled to control the line of scrimmage all night, surrendering five sacks and 1-ten tackles for loss. The biggest leak in terms of pass-blocking was from the defensive tackle and outside linebacker spots, as Vanderbilt interior defensive lineman Dare Odeyingbo collected two sacks and outside linebacker Charles Wright got two of his own. In the running game, the Raiders were unable to get any of their running backs or Stockstill going, only contributing a combined 69 yards on the ground. 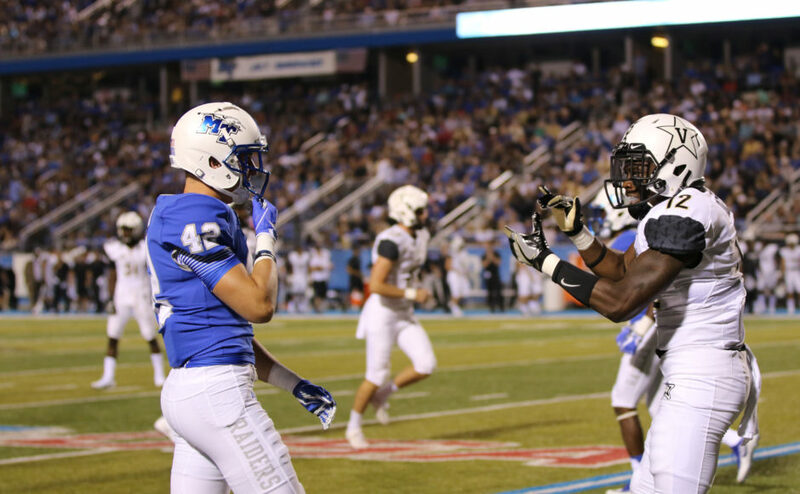 Defensive end Walter Brady was one of the lone bright spots in the game for Middle Tennessee, finishing the contest with a total of five tackles, including one for loss, a sack and one knocked down at the line of scrimmage. Brady seemed to have his way all night with inexperienced Vanderbilt freshman right tackle Devin Cochran, finding himself in the Commodore backfield often. On his sack, Brady beat Cochran around the edge and laid a big hit on Vanderbilt quarterback Kyle Shurmur to force the Commodores to punt for just the second time in three quarters. Brady also led the Raider run defense throughout the night, as they kept Vanderbilt quiet by only surrendering 71 yards on the ground and holding Webb to only 49 yards rushing. The Blue Raiders will hit the road next week to take on defensive coordinator Scott Shafer’s former team, the Syracuse Orangemen. Kick-off from the Carrier Dome is scheduled for 2:30 p.m. on September 9.